We met Marianne early (like 7:30 AM early!) on a Saturday morning at the Santa Fe Farmers' Market to do some shopping and chat with her about her journey in the food world. She has a blog, The Clarified Kitchen, and runs a meal plan company, The Clarified Menu, while also raising two young boys with her husband Hans. Marianne guided us through the farmers' market to her favorite stalls and picked up some fresh produce to create a custom recipe just for us! 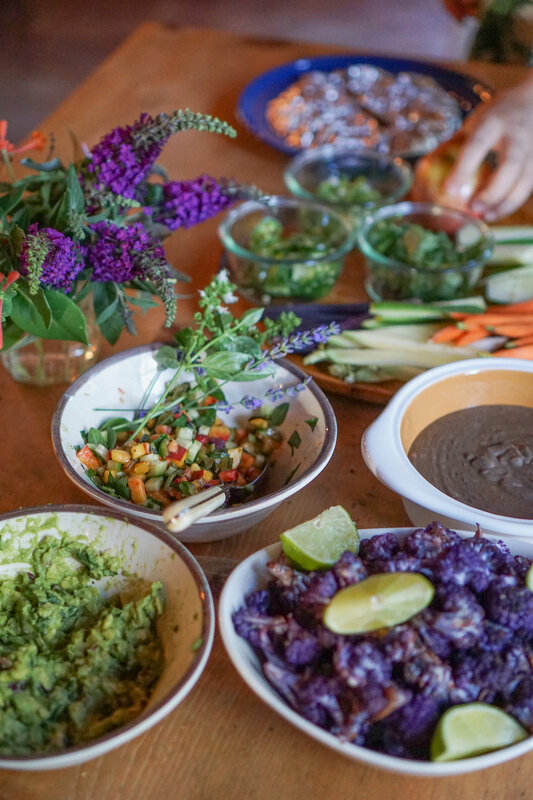 She was immediately drawn to a purple cauliflower, which sparked the idea to make caluliflower tacos. Scroll to the bottom to get the recipe for the delicious dish! SFF: Did you always know you wanted to be a chef? MS: Not at all. I've always been intrigued by the magic that can happen between people who are sharing food made with love, but for many years I thought I wanted to be a poet and spend all my days writing. As a 22 year old headed towards grad school, I felt like I needed to have an adventure first. So, a couple weeks after graduating from college with a degree in creative writing, I drove my ‘91 Toyota Camry to NYC for Culinary School. At first I thought I was there to get some experience under my belt that I could put to use in food writing, but I think I forgot all about food writing within the first week. I loved the intensity, the physicality, the new language of French cooking terms, and the strategy behind a finished dish in the context of a bustling restaurant. Actually, the longer I cook, the more I notice the similarities between writing a poem and writing a recipe. At the end of the day, you kind of want to get rid of all the unnecessary extra, all the fluff, and get down to the heart of the matter. Take for example a perfectly ripe heirloom tomato. A drizzle of good olive oil and a crack of sea salt is all you need. If you start adding too many ingredients, the point (and flavor) starts to get lost. SFF: What was your professional journey to get to where you are today? MS: Once I knew I wanted to cook, I quickly went all in. I wanted to work under the best chefs and learn everything I could. This was before chefs were celebrities. This is a laborious profession where you become a technical expert and craftsman. I've always imagined being a chef as similar to being a car mechanic or an expert welder or wood worker. You build up a muscle memory bank of technical skills, you use tools to fix things, and you put in the hard work to get it done. Of course there is an art to it too, as there is in any job, if you choose to participate with your work in that way. It was not an easy journey, especially at the beginning, mostly because I am a woman. I remember my first instructor in culinary school put all the women in my class on probation for completely ridiculous, subjective reasons that had nothing to do with the reality of our work ethic or cooking skills. Unfortunately, most of the women in my program eventually dropped out. I think my class graduated three women when it was all said and done. This was not the last time I experienced sabotage, sexism or disrespect in kitchens because of my gender. But having experienced that so early in my career, I gained a strength, determination and work ethic I didn't have before. I used these experiences to articulate the kind of cook and chef I wanted to be. I also worked with chefs who were advocates and champions for women in the kitchen. You don't hear about them as much, but they are out there. For the first six years of my cooking life, I worked in fine dining. I loved the art of this type of food. The whimsicality, the creativity, the luxury of it all. But over time I became more interested in where food came from and the stories of the farmers growing it. It kind of felt like I spent a good many years cooking and cooking, and then one day I got a peek behind the curtain. There was no going back. The more I learned about the effort and care that goes into growing organic and sustainable foods, the more valuable they became. The more valuable they became, the less I wanted to mess around with complex alterations. I now see the role of a chef to be one part technician, one part artist, one part teacher and forever a student of our food system. Now I'm interested in simple, delicious food that's grown in our community and I'm most interested in teaching home cooks how to cook local food year round with joy and confidence. SFF: How did you come up with the idea of The Clarified Menu? MS: I had been taking a break from working in restaurants since I had my son River who is almost six now. I had been doing restaurant consulting and a couple other projects. As a mom, I knew first hand how challenging it can be to find a time to wash your hair let alone cook food for your family. I had started the blog The Clarified Kitchen just as a place to post recipes for my friends and family. Then I started getting messages from moms who were feeling super big feelings like stress, guilt, and overwhelm around cooking for their family. I knew I wanted to help them in some way. I put together the idea for a digital meal plan with a shopping list and prep list delivered to subscribers inboxes once a week. I tested it first with a beta group of 40 people, I made a few tweaks and then we launched it 33 weeks ago (my husband Hans does all the web work and design). SFF: How has The Clarified Menu evolved since you started it, and what are your future plans for it? MS: The Clarified Menu is actually going through a big evolutionary period now. When I launched it, the focus was to help busy moms. I still want to do this, but I've realized over the past months that my happiest and most engaged customers are actually not moms at all. They are home cooks who want to cook seasonal and local food at home when they can. It's not the fastest or cheapest way to feed your family. It's a lifestyle, an intention, a celebration and lifting up of our community. For me, it's not about a bunch of rules. It's about real food that tastes amazing and makes us feel great. SFF: What's your personal philosophy toward food and diet? MS: This is an interesting question for me. I have always been an advocate for real food, mostly vegetables and everything in moderation. Now I'm in an exploratory phase of experimenting with which foods give me energy, which foods make me sluggish, etc. A lot of it is common sense but our bodies are so different. I want to learn what makes my body the best it can be. I'm definitely in the discovery phase. SFF: What advice can you give to novice home cooks? MS: Trust your taste buds. I will never forget this time a friend invited me over to her house to have lunch. I had just come off a busy weekend at work and I hadn't eaten an actual meal in three days. She nervously ladled lemon chicken soup into bowls, it was her Greek grandmothers recipe. With the first bite, tears literally filled up my eyes. The soup was filled with amazing flavor, but it was also made with love. We all are the chefs of our home kitchens. These aren't just rooms; they are often the heartbeat of our homes. It's up to us to decide what we like, what we love to make and what we share with our people. If I could wave a magic wand, I would give everyone a boost of cooking confidence. It's all one big experiment anyway. Oh, and a PSA: please don't be scared to cook for the chefs in your life...we get hungry too and probably only have mustard and hot sauce in our fridge. SFF: What is the best entrepreneurship advice you've ever received? MS: This is hard because I've received a lot of great advice over the past few years. I'm currently obsessed with The Courage & Clarity podcast hosted by Steph Crowder. She said something on one of her episodes that is now imprinted in my heart and head: "This whole building a business thing is gonna take a while… and that's ok." This simple simple sentence made my brain explode when I first heard it. When you're just starting out, and maybe it's just your mom and a friend who is reading your stuff, it’s not easy. In fact, I would say it feels the opposite of "ok". Creating a business is like putting two puzzle pieces together. Your work has to feel good in order to be sustainable, while at the same time fitting with something your audience wants, needs, and will pay for. I have had to learn to trust my gut and not be afraid to shift along the way. SFF: How did you decide to live in Santa Fe? MS: I had been visiting Santa Fe for over ten years before we moved here. Living in New York, Minneapolis and Chicago for most of my adult life, it was always my dream to move here someday. I have heard a bunch of times since we moved here that Santa Fe either spits you out or swallows you whole. I feel swallowed completely, and every day when I see the mountains I feel happy and grateful to be here. SFF: Where do you typically do your food shopping in Santa Fe? MS: I go to the farmers market almost every week with $40. I rarely spend it all, unless I'm buying meat, before my basket is full with veggies, the core of our meals for the week. I pick up eggs every friday at a woman's house who has arranged to be a drop off location for a farmer in Rowe. I buy raw milk at the coop, some specialty items at Whole Foods, and I also pick other items at Trader Joes. This combination is how I get to buy organic local food and make it work with our budget right now. SFF: What are you passionate about outside of running The Clarified Menu? MS: I love taking road-trips with my two kids, husband and dog. I love Murder She Wrote and am still upset that Netflix stopped streaming it. I love music, cats, poems and listening to records. MS: I want home cooks to feel joyful, confident and creative cooking seasonal, local food in their home kitchens. SFF: Is there anything else you want people to know about you or your business? MS: Our website is getting ready to go through some exciting changes to make it easier to search for recipes and save your favorites. You can go to theclarifiedkitchen.com and sign up for mailing list to stay updated. The idea for this recipe started last week when we saw the most beautiful head of purple cauliflower at the farmers market. Then, the next farmer's booth that we walked through had fresh red chili tortillas for sale, and the rest is history. Cauliflower is a star of the vegetable world that is too often overlooked. Here is a recipe to bring it into the spotlight. If you want, you can use canned black beans and skip the soaking step, but you will lose a certain depth of flavor. Soak the black beans the night before you want to make tacos: Rinse the beans in a colander and transfer to a bowl. Add enough water to allow the beans to double in size and remain under water. Put in the fridge overnight. Make the beans: In a pot, heat the oil over medium heat. Add the onion, garlic and coriander. Stir and cook for a few minutes. Drain the beans and add them to the pot. Add the coconut milk and add water to cover. Bring to a simmer, cover and cook for around an hour, until beans are tender. Add salt towards the very end of cooking to taste. You can either leave the beans as they are or blend them until smooth. It's totally up to you, but the pureed beans are silky and luscious. Roast the cauliflower: Preheat the oven to 400F. Line a large sheet tray with parchment, a silpat or foil. Spread out the cauliflower florets, drizzle with olive oil, sprinkle with smoked paprika, salt and pepper. Roast for around 30 minutes, or until cauliflower is tender. After the tray comes out of the oven, squeeze a half of lime over the top and transfer to a bowl. Make the peach salsa: In a medium bowl combine the peach, jalapeno, lime, drizzle of EVOO, basil, cucumber and a pinch of salt. Keep refrigerated until ready to use. When ready to eat the tacos, wrap the tortillas in foil and warm them in the oven for five minutes. Spread beans on the bottom of each tortilla, top with cauliflower and peach salsa. Enjoy!